Earlier this year the New York Times wrote about the massive gender gap among Wikipedia contributors: just 13 percent of them are women. Now Santiago Ortiz has crunched the data behind the encyclopaedia, and the results are telling. 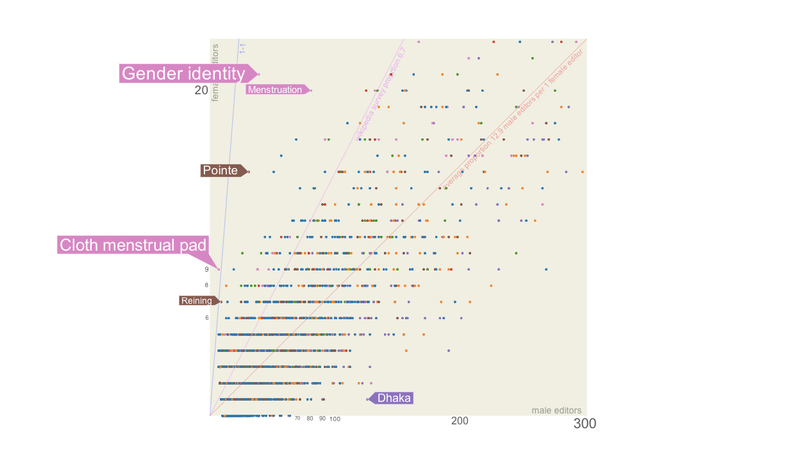 Using a gender API, Ortiz sucked out details about contributors from articles across Wikipedia in order to study the differences in male and female editing on the site. The result is an interactive scatter plot which shows how many female and male contributors each of the articles considered has. If you think it looks fair, check out the scales on the axes: the horizontal (male) axis shown here stretches up to 300, while the vertical (female) axis tops out at 22. The almost-vertical purple line represents where a one-to-one ratio in contribution would fall.